Size: 15.0 x 19.5 inches. 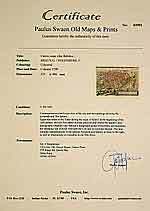 Condition: In fine condition on water-marked paper with mild age toning. 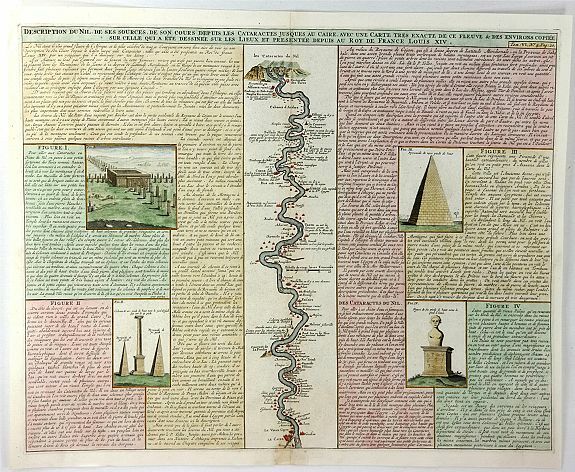 A fine folio engraving centred on the river Nile (with north at the bottom), stretching from the 1st cataract at Aswan to Cairo with accompanying text in French. On either side of the engraving are further inset engravings and explanatory texts of 1.The Temple of Isis at Aswan, 2. Small pyramids up to 70 feet in height, 3. Large pyramids up to 1400 feet in height and 4. A sphinx. From Chatelain’s “Atlas Historique”. Henri Abraham Chatelain's "Atlas Historique ..." was a multi volume publication, completed in 1719, comprising of finely engraved maps and topographical plates, genealogical tables and historical and geographical descriptions of all areas of the world.